SIR: I have the honor to submit the following report of the part taken by Troop D, Tenth Cavalry, in the engagements before Santiago de Cuba, so far as it is known to me. On the 30th of June the troop marched with the second squadron of the Tenth Cavalry, Major Wint's, from Sevilla and encamped a few hundred yards beyond El Poso on an eminence overlooking the basin of the San Juan River or creek. My troop served as support to Lieutenant Smith's, which was on picket about 100 yards to its front. In the morning it was placed on picket, relieving Lieutenant Smith's troop. Soon after my sentinels were posted I was ordered to withdraw my troop and prepare to march. Having done so, I took my place with my troop in the column, and, after waiting from half an hour to an hour for the column to move, marched with the column past El Poso and the division hospital in the direction of San Juan. The military balloon passed over our regiment from rear to front while we were at a halt. At a halt made soon afterwards I was ordered to have my men strip themselves of everything but arms and ammunition. The rolls, haversacks, and canteens of my men were taken off and laid on the ground near the road and two men detailed to remain with them as a guard. About this time our balloon commenced coming down near the head of our regiment. When about 100 feet from the ground it was fired at by the enemy's artillery. About the same time we received a volley of infantry fire coming down the road over our heads too high to strike anyone. The troop ahead of mine started to the rear, but was soon checked. I understand that the impulse to break to the rear was imparted to it by the Seventy-first New York. My men were lying down in the road facing to the left, by order of the squadron commander, Major Wint. The enemy's fire, delivered in volleys, kept taking the road and riddling the dense foliage about us. I thought that the enemy had the range of our position, or at least the direction of this road, and that the situation demanded that the troops be moved off the road either to the right or left, or formed so as to face in the direction from which the fire was coming. I looked around for the squadron commander to get his permission to move my troop off the road, or make a change of front with it to the right. He was not anywhere in sight. I had seen him some time before going toward the right of our line, or head of our column. After waiting some time for him to return, I acted on my own responsibility by bringing my troop around at right angle to the road, its right resting on the road, its left lying in the wood. In this position I was free from the troop on my right, in case it should again break to the rear. I was under the impression that we were much nearer the enemy than afterwards proved to be the case, and expected the regiment to deploy across the road at any minute. From my studying of tactics and the drill regulations, together with my limited experience in field exercises, I knew that in dismounted fighting, especially in a densely wooded country, the time comes when the direction of operations is necessarily left to the company commanders, and I judged that this time had come or could not be far off. I did not know but that the squadron commander was disabled, and I was determined that my men should not be decimated without doing any execution through fear of responsibility or lack of initiative on my part. I felt that it would be erring on the right side to anticipate slightly the proper time for independent action on the part of company commanders. After waiting a minute or two in my new position, the enemy's fire not abating and no superior officer appearing, I faced my troop to the left and pushed into the wood far enough to clear the road by about 10 or 20 yards with the rear of my column, when I came upon a line of infantry skirmishers apparently without officers. I had my troop face to the right, or in the general direction in which the road ran, and prepared to advance. In anticipation of the difficulty of penetrating the dense undergrowth I took immediate charge of one platoon and gave my lieutenant, Second Lieut. J. F. Kennington, Tenth Cavalry, charge of the other, with instructions to keep his platoon in touch with mine. I then proceeded to advance in a direction generally parallel to the road which I had just left. I expected that by the time I arrived abreast of the head of my regiment I would find it deployed or deploying. Under the enemy's unaimed fire we pushed through the dense wood and undergrowth, waded a creek about knee deep, and a short distance beyond it came upon a line of troops lying in a road; but it was not our regiment. Here I received word from my lieutenant that he, with his platoon, was some distance to my right. He inquired whether he should join me. As there was a heavy fire coming down the road and I did not wish him to expose his men unnecessarily, I answered in the negative. The bearer of the message to and from me was Sergt. George Dyals, of my troop, who was afterwards wounded so that he lost the sight of one eye. He has since been discharged for physical disability. The wood terminated in a thin belt just beyond this road. After lying a few minutes in the road I proceeded with my platoon through this belt of wood and came upon open ground overgrown with tall grass reaching nearly to the waist. Here the enemy's fire seemed to come principally from our left. I accordingly faced my men to the left, and filed off in that direction. As a number of bullets dropped near us, Sergt. James Elliott of my troop came up to me, and pointing to a tree on our right, said that he saw something stirring in it; that it looked like a Spaniard, and that he would like my permission to fire at it. I looked at the tree, but it was so dense that I could not see into it. I had been cautioned by troops whom I had passed against firing, as there were troops of ours in front. Remarking that it might be a Cuban or one of our own men, I refused the permission. Soon afterwards, while we were lying down, Private George Stovall of my troop was shot through the heart and killed; the same shot wounded Private Wade Bledsoe in the thigh. 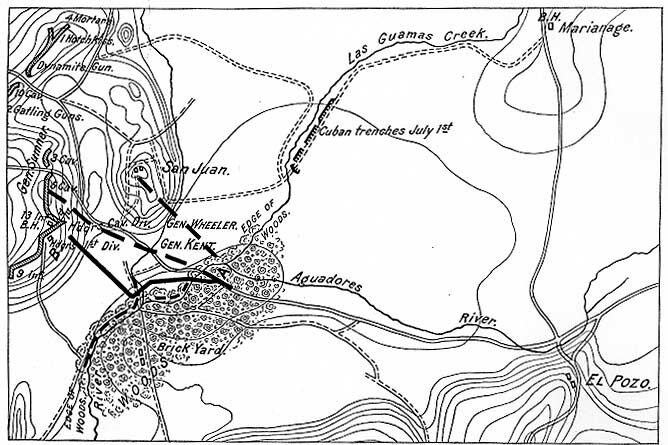 MAP SHOWING ROUGHLY THE COURSE OF TROOP D, TENTH CAVALRY, JULY 1, 1898, AFTER LEAVING THE REGIMENT, AND THE GENERAL DIRECTION OF THE ATTACK MADE BY THE REGIMENT. Full line in black: Course of Troop D. Broken line in black: Direction of the two squadrons of the regiment. A. Where Troop D left the regiment. B. Where Captain Bigelow was disabled. About 100 yards farther on we came upon a squad of infantrymen sitting under some trees on the edge of the aforementioned belt of wood, around an officer who -was lying on his back bleeding from the face, and who died while we were there. I believe that this officer and Privates Stovall and Bledsoe were shot by the sharpshooter whom Sergeant Elliott wanted to fire at. The infantrymen stated that our men were falling back and the Spaniards advancing. We could not see any enemy. On our left was a stream which I took to be the one which we had crossed. From the other side of it came sounds of voices and loud reports of firing. We could not tell whether they were Spanish or American, but I thought it was best to take our chances on their being American. We accordingly waded the stream, and pushing into the wood on the opposite bank, found ourselves among the men of General Hawkins's brigade. They were lying in a road on the edge of the wood. Beyond them stretched a plain about 600 yards wide, overgrown with tall grass like that through which we had just passed. At the farther edge of the plain was a hill about 150 feet high, now known to our troops as San Juan Hill, or a part of it. On the top of this hill was a blockhouse and a structure that looked like a shed. Here and there a puff of light smoke indicated that the position was manned by infantry, who were firing at us. About 100 yards in front of the line which I joined was a - thin line of infantry firing at the enemy on the hill. It seemed to be falling back on the main line. There was no firing in the latter. My men and myself laid down in this road with the infantry. Everybody whom I could then see was lying down except one officer of infantry who was walking up and down the road in rear of the line exposed to a fire which raked the road. From conversation with officers of the Sixteenth Infantry I understand that this was Capt. George H. Palmer of that regiment. I asked him whether it was not about time to advance to the support of the line out in the plain which seemed to me to be falling back. He replied that he supposed it would be pretty soon, and kept on walking as before. Sergeant Elliott of my troop asked permission to go up to the fence and do some firing. I replied, "Go ahead, Sergeant, if you think that you can do any good." He accordingly stood up by the fence and fired seven shots, when, having attracted the enemy's fire, he fell back and lay down. Immediately in front of us beyond the road ran a barbed wire fence. There were no wire nippers in my troop. With a view to an advance through this fence, I dug with my hands at one of the fence posts, but soon concluded that I could not accomplish anything in that way. I then stood up and pulled and pushed at the post, but made no appreciable impression on it. So I lay down again and continued looking out on the plain for signs of an advance. After a while I observed near the end of the open plain on our left a swarm of men breaking forward from the road. I went up to the top of the wire fence by stepping from wire to wire near a post, and jumped off the top, calling to my men as I struck the ground to come on. Corporal John Walker of my troop got a bayonet and cut the wire. My men and a number of infantrymen went through the opening thus made. I struck out as fast as the tall grass would permit me toward the common objective of the mass of men which I now saw surging forward on my right and left - San Juan Hill. The men kept up a steady double time, and commenced firing of their own accord over one another's heads and the heads of the officers, who were well out in front of the men. I tried to stop the firing, as I thought it would seriously retard the advance, and other officers near me tried to stop it; but a constant stream of bullets went over our heads. the men halting in an erect position to fire. The men covered, I should say, about 50 yards from front to rear. They formed a swarm rather than a line. When they were not firing they seemed to be all cheering and yelling. Our firing, though wild, was not altogether ineffective, and retarded the advance less than I had thought it would. I could see the side of the hill dotted with little clouds of dust thrown up by our bullets. We evidently peppered it pretty hotly from top to bottom, and I have learned since then that many dead and wounded Spaniards were found in the trenches on the top of the hill. These casualties, however, were caused in part, perhaps mostly, by the fire of our small advance line prior to the assault. This line was composed, I understand, mostly of classified marksmen and sharpshooters. As we approached the foot of the hill our artillery commenced firing over our heads at the enemy on top of it. This caused a slowing up in the general advance. When I was about half way up the hill I was disabled by three bullet wounds received simultaneously. I had already received one, but did not know it. What took place subsequent to my disablement, in the direction of the enemy, is known to me only through the statements of my men and others, substantiated by the depositions inclosed herewith. My platoon went to the top of the hill with the infantry, and was soon afterwards conducted by Lieut. J. J. Pershing, regimental quartermaster, Tenth Cavalry, to the line of the Tenth Cavalry, a short distance to the right. The following men of the platoon especially distinguished themselves: Sergt. James Elliott, Corpl. John Walker, and Private (now Corporal) Luchious Smith. Sergeant Elliott and Private Smith were, during the ascent of the hill, constantly among the bolder few who voluntarily -made themselves ground scouts, drawing the attention of the enemy from the main line upon themselves. Corporal Walker was with the handful of fearless spirits who accompanied Lieut. J. G. Ord, of the Sixth United States Infantry, forming with that splendid young soldier the point of General Hawkins's gallant brigade, the head and front of the assault; and it was Corporal Walker who avenged the death of Lieutenant Ord. First Sergt. William H. Givens was with the platoon which I commanded. Whenever I observed him he was at his post exercising a steadying or encouraging influence upon the men, and conducting himself like the thorough soldier which I have long known him to be. I understand, to my great satisfaction, that he has been rewarded by an appointment to a lieutenantcy in an immune regiment. I think it due to the other men of my troop to say that, with one exception, they proved themselves ready to follow me wherever I would lead them. Their conduct made me prouder than ever of being an officer in the American Army, and of wearing the insignia of the Tenth United States Cavalry. The movements of the platoon commanded by Lieutenant Kennington have, I believe, been reported to you by that officer. Killed, Private George Stovall. Wounded, Capt. John Bigelow, jr.; Sergt. George Dyals, Sergt. Willis Hatcher, Private J. H. Campbell, Private Henry Fearn, Private Fred. Shockley, Private Harry Sturgis, and Private James F. Taylor. Missing, Private James Clay. The accompanying map, marked D, is intended to show roughly the course taken by my troop after it left the regiment, and the general direction of the attack made by the regiment. Captain, Tenth Cavalry, Commanding Troop D.
Gatewood, Willard B., Jr. "Kansas Negroes and the Spanish-American War." [PDF, 2.5MB] Kansas Historical Quarterly 37 (Autumn 1971): 300. 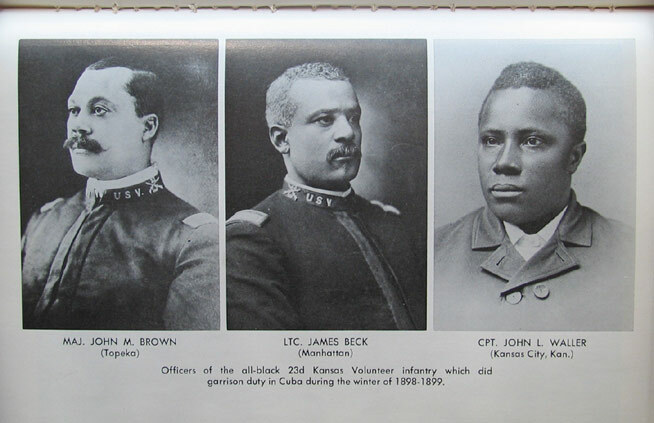 Focuses on black newspaper reaction but includes photos of 23rd Kansas, an all black regiment commanded by black officers, which did garrison duty in Cuba in 1898-1899. Ready and Forward Again. . .